Characterization Techniques for Perovskite Solar Cell Materials: Characterization of Recently Emerged Perovskite Solar Cell Materials to Provide an Understanding of the Fundamental Physics on the Nano Scale and Optimize the Operation of the Device Towards Stable and Low-Cost Photovoltaic Technology explores the characterization of nanocrystals of the perovskite film, related interfaces, and the overall impacts of these properties on device efficiency. 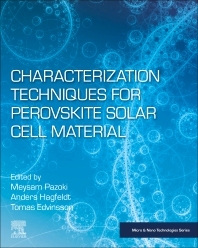 Included is a collection of both main and research techniques for perovskite solar cells. For the first time, readers will have a complete reference of different characterization techniques, all housed in a work written by highly experienced experts. Meysam Pazoki, Ph.D. is a researcher with the Department of Chemistry, Uppsala University. Dr. Pazoki received his Ph.D. in Physics from Sharif University of Technology. His areas of interest include (T)DFT calculation of semiconductors for Photovoltaic devices and CO2 reduction applications; dye sensitized and Perovskite solar cells, UV Photodetectors; as well as device characterization methods including: Impedance spectroscopy, Electrochemical methods, Small photovoltage/current transients; Material Characterization: Laser Spectroscopy, Stark spectroscopy. Prof. Anders Hagfeldt is regarded as one of the world's leading researchers into dye-sensitised solar cells. Using various methods and new nanostructured materials, he and his research team have succeeded in substantially improving the efficiency of these third-generation solar cells. Anders Hagfeldt is regarded as a highly creative scientist who throughout his fundamental research never loses sight of the industrial application. He is the Head of the laboratory at the Laboratory of Photomolecular Science, Ecole Polytechnique Federale De Lausanne, a leading institution in the field of solar cell research. Prof. Hagfeldt is the recipient of the Thuréus award” from Royal Society of Sciences and the Norblad-Ekstrand medal” from The Swedish Chemical Society. Dr. Tomas Edvinsson is a senior lecturer in Solid State Physics with the Department of Engineering Sciences, Uppsala University. His key areas of research focused on the Experimental and theoretical investigations of low dimensional semiconductors for solar cell, catalytic- and photocatalytic applications. Investigations of electronic and vibrational quantum confinement and development of experimental photoelectrochemical methods to quantify band edge energies and fluorescing trap states. Development and implementation of Raman spectroscopy, classical and quantum mechanical calculation methods. Dr. Edvinsson holds 6 parts with BASF AG within solar cells materials. Since 2015 he has served as a member of the editorial board of Elsevier’s Chemical Data Collection.